A modern take on the award-winning Weekender® collection. The minimalist dial design and clean lines pair perfectly with the signature interchangeable straps to complement everything in your closet. You just found the only watch you’ll ever need. Featuring the INDIGLO night-light and 30 metre water resistance. 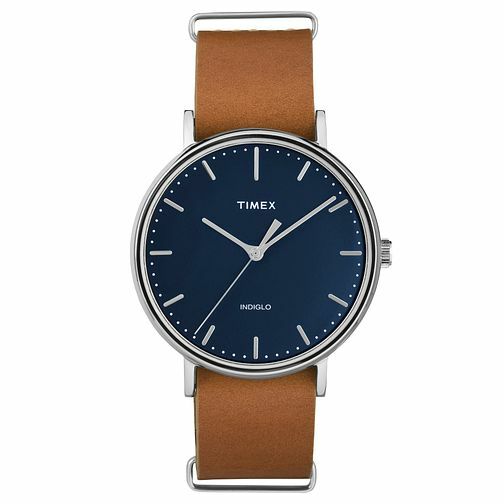 Timex Men's Weekender Fairfield Tan Leather Strap Watch is rated 4.0 out of 5 by 1. Rated 4 out of 5 by Anonymous from Beautiful minimalistic watch I bought this watch hoping for a watch I could wear every day, but was still classy enough to be worn in a semi formal situation. This fits the bill perfectly. The deep blue face is a really nice colour that comes through even more in person than in the images. I have yet to find a colour that this watch clashes with. The strap it comes with is a really nice colour contrast but makes the watch stand a little proud on the wrist for my taste as I have relatively slim wrists. As a result I chose to replace the strap with a tan brown one I bought elsewhere, but I still occasionally swap the strap back out which is easy due to its design. It has a nice weight to it, enough that you know you're wearing a watch but not so heavy that it becomes cumbersome. I would thoroughly recommend this watch to anyone looking for a versatile watch for almost any occasion.